"The beach is not the place to work; to read, write or think [...] - at least, not at first. [...] the tired body takes over completely. As on shipboard, one descends into a deck-chair apathy. One is forced against one's mind, against all tidy resolutions, back into the primeval rhythms of the sea-shore. [...] And then, some morning in the second week, the mind wakes,comes to life again. [...] It begins to drift, to play, to turn over in gentle careless rolls like those lazy waves on the beach. One never knows what chance treasures these easy unconscious rollers may toss up." Anne Morrow Lindbergh, Gift From The Sea (Pantheon Books: New York, 1955), pp. 15-16. On returning from our holidays in Belle Ile en Mer a few days ago, I found a parcel from Stephanie over at Woolythyme; an exquisite knitted shell together with the book, Gift From The Sea, quoted above. It was, simply, the perfect gift to receive after our time away by the sea. I have already touched upon the enchanting beauty of this Breton island last year. Countless thoughts and adjectives spring to mind when I look back on those precious weeks. Sometimes returning to the same place twice with the same fellow travellers can be a little risky. Will it be as wonderful as the last time? Will the place hold the same magic still? Of course, we needn't have been concerned. The air was still as pure, the weather as gloriously clement and the seafood as delectable. However, if I am honest, the predominant emotion I am left with is gratitude. Not for this island (I've always really wished I could live an entire year there) nor for the salty air and glittering sand but for my family. It's hard not to get emotional whilst writing these words. As many of you know from personal experience, it isn't easy living in a different country from the majority of your loved ones. I prefer to put these regrets to one side and to feel deep, deep gratitude for having a family in which EVERYBODY gets on so very, very well. All those lengthy conversations, silly jokes and long, long hugs have left me feeling calm - I'll admit, it took me quite a while to relax this summer - and positive. Perhaps the person I hugged the hardest was my father - can you believe he will be turning ninety-two in a couple of months?- and my wonderful mother too, of course! It is thanks to their love for us all and their generosity that that we were able to spend these days together. And so I am back home. There are new adventures around the corner, many animals - not just hares - to create and an exciting business venture I'm so thrilled about. Until I return with more news I will share, below, a few pictures of recent knits. Because when there are holidays there is time to knit and read, and read and knit. The Duck Egg Blue cardigan Angélique is wearing is a new pattern by Georgie Hallam called Posy. If you'd look closely you'd find the odd grain of glittering sand and wisps of dried grass from Belle Ile as I knit this pretty much everywhere we went. I even took it on a four-hour boat trip around the island although it was far to windy to wrestle with four double pointed needles! The flower meadow, incidentally, is not the one in Belle Ile but another, equally beautiful, a few minutes' stroll from our home. The baby cardigan was a gift for the hotel manager's wife who has a eight-month old daughter named Valentine. I wanted to show my gratitude for the summer job Héloïse had been offered in Belle Ile. The pattern is my third version of Dani Sunshine's Bella and I still love it as much as my first attempt. My Ravelry notes for both knits may be found here and here. Tomorrow is school and I would like to wish all parents and children a very happy new school year. Finally, whilst I've been away from the computer for the best part of a month I have finally joined Instagram and am thoroughly enjoying it! Would you like to come and say hello? I am hugely looking forward to visiting your blogs again. What an interesting summer it has been so far! Almost four weeks after the last of three cases of Scarlet Fever in our family I think it is safe for me to proclaim jubilantly that Tristan and I have trumped this unpleasant and rather vintage illness. The sore throat Héloïse started on the day of her Baccalauréat results was the first symptom of Scarlet Fever, poor child. All is well now. 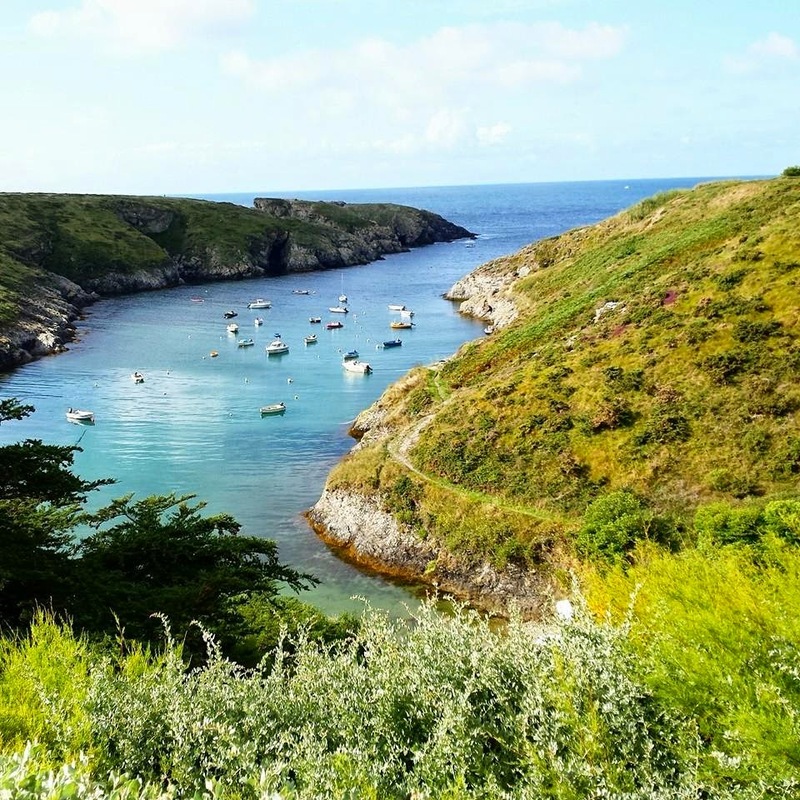 Héloïse left, a week behind schedule, to start her first summer job in a splendid hotel on the island of Belle Ile en Mer and the rest of us have been relishing the tough, resilient Paradise of high summer in Touraine. There is nothing fey or delicate about blooming fists of lavender. "Yikes!" I say out loud, in a mixture of delight and confusion when I observe our fast-growing garden. Let us say that weeks of intense sunlight and rainfall have been a boon to all plant life. I love the way the garden becomes an outside room during the summer months. Our small house grows bigger. Evenings spent with special friends, barely able to hear the trilling crickets over our shrill laughter. Candles in holders casting lacework shadows over our lichen-covered cherry tree. Another bottle of champagne? Why not! It will help us forget the latent threat of voracious mosquitos. The food we eat is simple and good. Shortcrust tarts with goat's cheese, tomato and basil. Greek salad with just enough red onion and a big fistful of dill. Luscious apricots and peaches are always piled up high in our fruit bowl. They must be gobbled up fast; the hot, humid weather spoils them quickly. My current favourite - and Tristan's too - is a tart made with peaches and a few sprigs from our lavender bush. * The secret is to mix in a few lavender flowers only. Summer is the song everyone is humming and I, perhaps, more loudly than all. Victoria Finlay's fascinating book, Colour, has inspired me to play with the bright and vibrant this season, even more than usual. I stayed up far too late last night reading her chapter on Orange (my least favourite colour). 'Dance the orange,' the German poet Rainer Maria Rilke wrote in a wonderful waltzing poem about a fruit and a colour that pretend to be sweet but are actually rambunctious and challenging. Last night's compelling read transported me to the city of Cremona in Italy where, around 1750, the secret of how Antonio Stradivari made the orange varnish for his instruments was lost. Doubtless, I will be writing about this book again in the future. In the meantime the pictures below testify to my love affair with summery colours and Liberty fabrics which I always purchase from this, my favourite online shop. Angélique's dress fabric is Floral Eve, from the Spring & Summer 2013 collection. 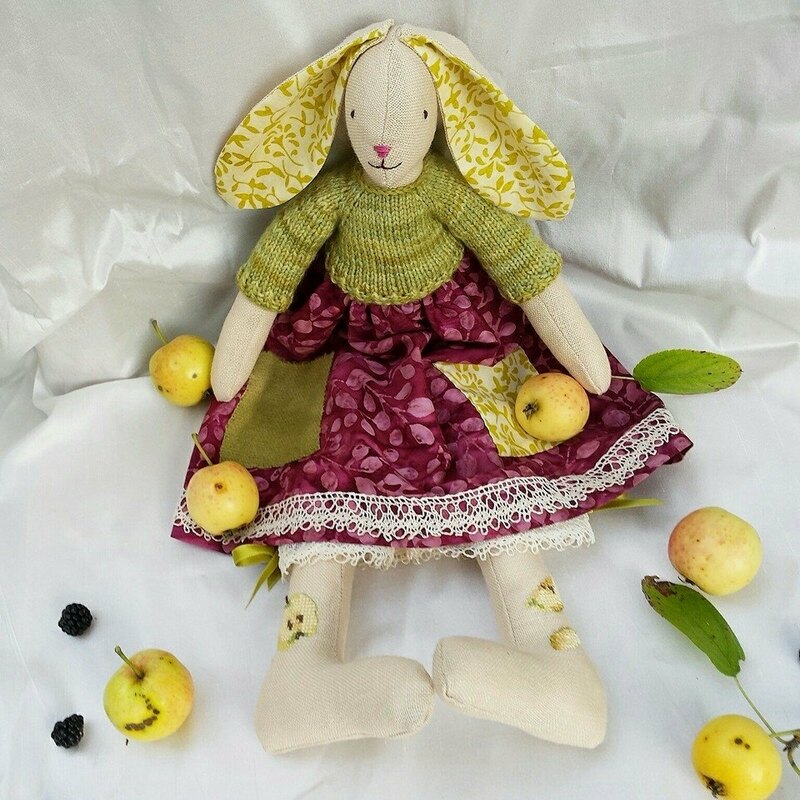 The pattern is Suzanne from the French Citronille pattern and fabric shop. Amazing, beautiful, easy patterns which can be purchased in English. I know that Soule Mama and Posie gets Cozy are huge fans too. And that beautiful floral wreath? Another success from the talented Michele from Amore Bride. Summer has also brought a dose of magic. For those who have not read this little story over on my Madame Millefeuilles page, you will find it here. Tomorrow is Mickaël's birthday. Tomorrow we set off for Brittany where the next chapter of our summer begins. Next week I am hoping to, finally, upgrade my mobile telephone in order to join in with the Instagram fun. * It's easy as pie to make. The usual shortcrust pastry first, and then slice a few peaches or nectarines which need to me mixed gently with 3 tablespoons of cornstarch or arrowroot powder, 100 g of sugar, I tablespoon of lavender buds, I teaspoon of vanilla extract and a pinch of sea salt. Pop the tart into the oven - preheated at 180°C/375°F - for around 30 minutes after having dotted a few nobs of butter onto the peaches.